While national discourse often restricts regional leaders to their respective states or regions, Tridivesh Singh Maini argues that their global vision must be invited onto the world stage by Prime Minister Modi. There are a number of developments over the past few days which yet again send a strong message that states are bound to play a substantial role in India’s ties with the rest of the world. It is not just Chief Ministers belonging to the BJP or the Congress who have been pro-actively involved in what has been dubbed as Para-Diplomacy, but even Chief Ministers belonging to regional parties. For long, leaders of regional parties were perceived as myopic in their views and also thought to be obstructionist (especially when it comes to ties with neighbouring countries). First, N. Chandrababu Naidu, the Andhra Pradesh Chief Minister, left no stone unturned in the hard selling of Amaravati, the capital of Andhra Pradesh which arose as a result of bifurcation into AP and Telangana, attending the recent International Mayors Conference in Singapore on July 9, 2018). Naidu highlighted his detailed vision for Amaravati, and spoke about how it would be amongst the top 5 cities in the world, through world class infrastructure. Asian Infrastructure Investment Bank (AIIB) Director-General of Investment Operations Pang Yee Ean evinced interest in Amaravati, and stated that his organization was willing to work with Andhra. Said Pang Yee Ean “We are willing to work with the State government to develop roads, water supply, irrigation, electricity and more”. Singapore is partnering with Andhra Pradesh and the Minister of National Development, Lawrence Wong praised the progress of Amaravati, stating ‘We want a population in Amaravati as we have noticed that the progress of building the city is very good’. Naidu’s job as CM of Andhra Pradesh without Hyderabad often dubbed as ‘Cyberabad’ one of the IT Hubs of India (which is now capital of Telangana) is clearly much tougher. He has been wooing investors from different countries including China, Japan, South Korea. He has visited China on two occasions, and has been working closely with Japan. A separate desk has been set up in the Chief Minister’s office to supervise investments. He has also made it a point to be present at important gatherings like the World Economic Forum (WEF) in Davos. Such efforts have not gone unnoticed – as illustrated in Andhra Pradesh’s position as No.1 state in the Ease of Doing Business Rankings brought out jointly by the World Bank and DIPP (Ministry of Commerce, Government of India). Apart from the city of Amaravati, Naidu is also trying to develop Andhra as a logistics and health hub, setting up a maritime board for enhancing maritime infrastructure, with the ultimate view of enhance connectivity with South East Asia. 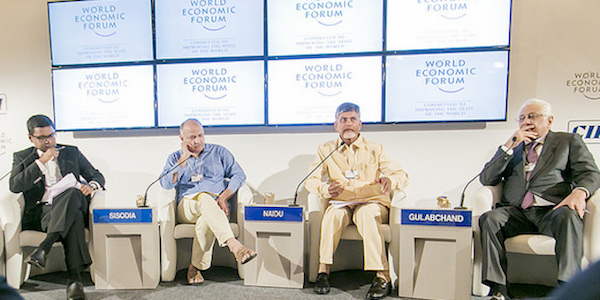 N. Chandrababu Naidu (third from left) and fellow panellists during the World Economic Forum National Strategy Day in New Delhi, 2015. Photo credit: World Economic Forum, Flickr, CC BY-NC-SA 2.0. It is not just Naidu, but also Mamata Banerjee, CM of West Bengal, who has tried to strengthen linkages with not just neighbouring Bangladesh and China, but also the UK. Banerjee, was repeatedly invited by China and was set to visit recently, but had to cancel at the last minute since she was unable to secure an appointment with one of the top leaders of the Communist Party. China has been showing increasing interest in West Bengal, given the latter’s important location. Beijing has been pushing hard for the BCIM (Bangladesh, China, India, Myanmar) corridor which extends 3000 kilometres from Kolkata to Kunming. As a consequence of tensions over the Belt and Road Initiative (the main bone of contention being that the China-Pakistan Economic Corridor passes through disputed territory), New Delhi has been lukewarm to this proposal. China has also been trying to strengthen people to people linkages with West Bengal. Significantly, it will be funding the Durga Puja in Kolkata this year. The most recent outreach of West Bengal CM has been to the UK (which she visited in November 2017) and she has not restricted herself to seeking Foreign Direct investment. The West Bengal Government recently signed an MoU (Memorandum of Understanding) with British Council UK on July4, 2018 for strengthening cultural ties and people to people contact. The MoU was signed by the British Council (India) Director Alan Gemmell, and state Home Secretary Atri Bhattacharya in the presence of the West Bengal Chief Minister. In a gesture of cultural exchange, and one which also recognizes the UK’s significant ties with the region, the Durga Puja Festival will be in focus during the Totally Thames Festival (august 18, 2018-September 30, 2018), while a River Festival along the lines of the Thames Festival will be hosted in West Bengal. Other areas of cooperation include Skill Development and English language training. Such steps by regional leaders are encouraging and the fact that a number of states like Andhra Pradesh and Telangana led by regional leaders are doing well in the Ease of Doing Business Rankings attests to the efforts of regional leaders to draw foreign direct investment (FDI). Whilst states like West Bengal may have not been able to draw FDI, their focus on strengthening cultural linkages with not just neighbouring countries, but also internationally, should be welcomed. It is thus important for the Modi government to highlight/showcase the achievements of Non-BJP governments, and not restrict itself to promoting the successes of BJP led governments. Apart from this, the PM should include Chief Ministers belonging to non-BJP parties in overseas delegations if he actually wants to promote what has been dubbed as ‘Cooperative Federalism’ as well as holistic growth. While the overall discourse restricts regional leaders to their respective states or regions, the examples discussed clearly show that some of them have a global vision. Tridivesh Singh Maini is a New Delhi-based policy analyst associated with Jindal School of International Affairs, Sonipat. His areas of interest include the India-China-Pakistan triangle, the role of India’s state governments in foreign policy (especially the economic dimension), and federalism in India. He was a South Asian Voices Visiting Fellow at the Stimson Center, Washington DC and a Public Policy Scholar with The Hindu Centre for Politics and Public Policy, Chennai. He has previously worked with The Observer Research Foundation, New Delhi and The Indian Express, New Delhi. Maini is a regular contributor for The Diplomat, Global Times and Quint.